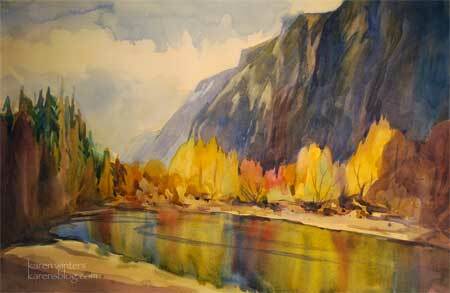 The colors of fall dazzle when caught, reflected in the serene waters of the Merced River. This large (half-sheet) watercolor takes advantage of the range of Yosemite’s beauty and is a preview of some new work I’ll be showing this year, both in watercolor and in oil. When I’m exhibiting at a public show, one of the questions that people ask me most frequently is “which do you prefer painting, watercolor or oil?” It’s a hard question because the two media are so different in some ways, yet so similar in fundamental ways. For the sheer excitement of painting with all the unpredictability and opportunity for “happy accidents” you just can’t beat watercolor. Take a look at the luminous reflections in the water, for example, they were created with a wet into wet technique. You can certainly paint water in oil (and I do it all the time) but you can’t get a look exactly like that. Oil allows you the luxury of correcting mistakes more easily. Watercolor (especially when working with staining colors) can be very unforgiving. The short answer is, I love them both, for different reasons and I find that what I learn in one medium can often be applied to the other even though paint handling is different. The basics … color, line, shape, value, feeling, interpretation, composition … these things do not change and translate easily from medium to medium. Here’s a closeup of just a detail of one of the trees. This would actually make a nice painting, enlarged, all on its own. Hmmmm, wheels turning … stay tuned. 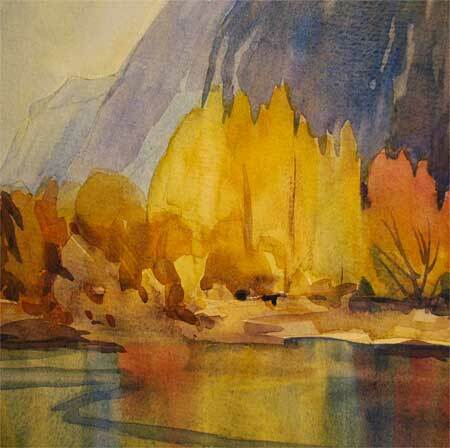 Watercolour – spontaneous, fresh. This looks like something out of a Lord of the Rings movie or something. Quite magical. Looks like your new year is off to a terrific start! I love the colors of the trees as well as their shapes…..
Karen, you said it perfectly! The excitement and spontaneity of watercolors is exactly why I like too. You never quite know what is going to happen when you put the paint and the water together. It’s serendipity! This painting is simply stunning, especially the water reflections. Wow! This is just stunning! You have really captured the light!! 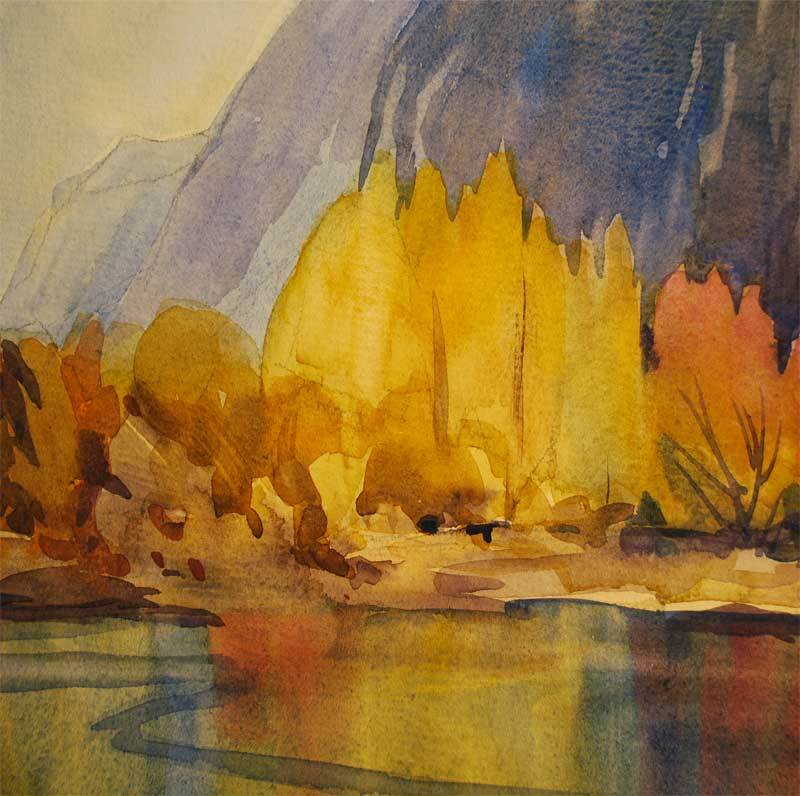 I’m trying to find some info on the Yosemite Autumn painting.